CustomEssayMeister.com prices, discounts and promo codes in the latest review! 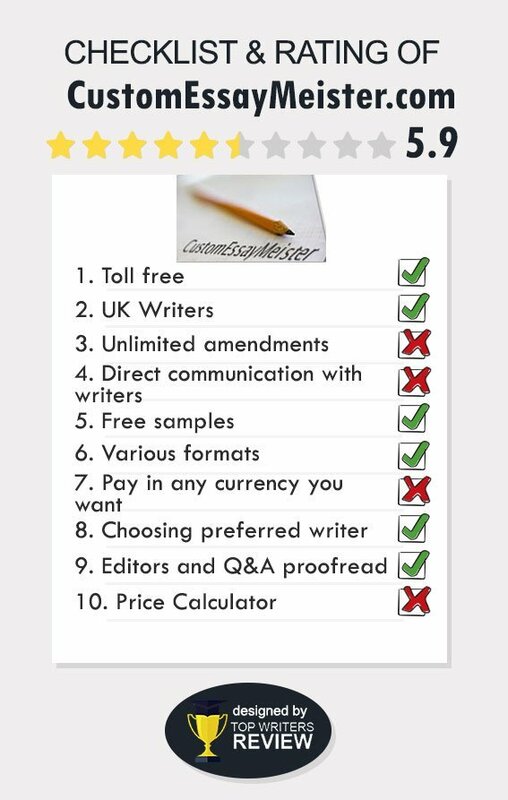 CustomEssayMeister.com has been in the writing service industry for about 10 years. Given that, we have been able to find a great deal of information about the company both on its site and elsewhere online. We have conducted this evaluation and review considering several factors – the company published information on its website, CustomEssayMeister customer reviews, writing samples on the site, when available, its pricing and discounts, and our assessment of customer support and the quality of writing of a research paper we ordered. This CustomEssayMeister review is the result of our findings. The company offers all varieties of academic writing products for students at any level of study. These range from simple essays through graduate level capstone projects, such as theses and dissertations. Other academically-related services include editing, proofreading, and admissions and personal statement essays. Assignments with math and science problem sets is also available. For career professionals, there are resumes, CV’s and cover letters, as well as grant proposals. Business plan writing is also offered, as well as other business-related products. Customer support is available via phone and chat, and we did contact that department to ask questions. In both instances, the individual with whom we spoke was obviously foreign, difficult to understand, and was unable to answer with much detail. We were referred to the FAQ page and to our writer. Custom Essay Meister states that all of its writers are native U.S. or UK professionals, with degrees from credible universities. As well, Custom Essay Meister testimonials published on the site are highly complimentary. When reviewing the comments and feedback found off-site, however, the story is a bit different. Customers complain about writing quality. There are three writing samples published on the site – an essay, a movie review and a paper. Upon reviewing these, we did have some concerns – spelling and punctuation errors, the lack of thesis statements, poor transitions between paragraphs, and some lack of coherence in terms of logical flow of ideas or points. As well, these samples were from 2000, and the company has only been in existence, according to the site, since 2006. The research paper we ordered was at the university level, but was far too elementary for that. It would have been appropriate for a high school student, and we also found word usage and sentence structure errors. While CustomEssayMeister is not a scam, we were not impressed with the writing quality. CustomEssaymeister.com prices fall within the above average range. Our paper, 8 pages with 4 references and a 7-day deadline was, $183.60, and there was a Custom Essay Meister promo code for a 10% discount as a new customer. Payment is safe and secure and can be made via any major credit card. CustomEssayMeister discounts are lifetime of 5, 7, & 10% with expenditures of $500, $1000, and $2000 respectively. The company states that it does periodically provide CustomEssayMeister.com coupon codes but that these may not be used in conjunction with the lifetime discounts. Customers must choose one or the other. Other than revision, we found no other special benefits or perks. They leave much to be desired but they did rescue me with the urgent paper I had. If not for the urgency, it could be researched better, structured in a more beneficial and logical way, and the typos.. but overall, it was just fine for the last paper in the course, that was only needed for the quantity. I ordered an essay from them 3 weeks in advance hoping evrything would be ready on time. Unfortunately, I couldn`t hand in my task before the deadline because of a number of resivions. The worked on them very slowly and still, the final result wasn`t perfect. I`m not sure I will ever work with this website again. I`m frightened by the results and by what I have heard from my professor. He seemed to be extremely disappointed in me and my paperwork... the one I ordered here. Moreover, it was pricey. I didn`t want to pay that much for a single page of my economy research paper. I`m in doubts and not sure it`s a good idea to use their writing services or any help at all. I don't like that they don't have a price quote. Sure, I can always type in the type of paper and amount of pages I want and get the price but what if I want to compare their rates with other service's? Why do I have to wait or call the support?